This isn’t the greatest photo as I took it on my phone from a distance. 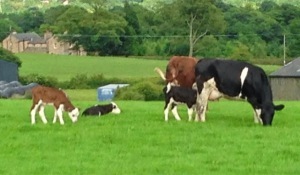 But great news; the Calving worked and the Calf and her new Mum were grazing with their herd tonight. Farmer Kath told me they would not do this until they were happy the process had worked. And the Cow had fully accepted the Calf. What a great ending to rough start in life for the little Calf. Previous Post Media Make Up, Speciall Effects Demo by Thomas E. Surprenant.